I feel like everyone is forgetting that the SNES has a 15-bit RGB (as in non-indexed) colorspace and that this whole colorspace is used for color math. So you can't really apply color indexing optimizations here unless you want really big lookup tables (For any single CGRAM state, theoretically up to 65536 entries, with many of them regenerated every time there's a palette change, and even then you'd basically just be caching addition which will probably give you very limited gains if any). Good point. SNES hardware color math doesn't involve multiplication; it's just addition or subtraction with an optional right shift (basically - I'm not sure what the exact hardware implementation of the division by two is). It's done once per pixel, as the PPU is generating the signal to send to the TV, and the result is not stored. 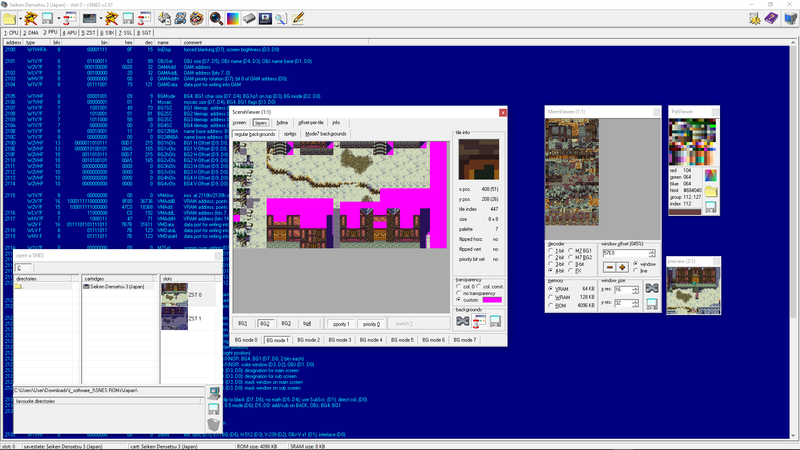 Software color math on SNES is (I assume) much rarer and mostly done with precomputed palettes stored in ROM, like the day/night idea mentioned earlier. I do not understand why pre-computing a 256x256 palette for colour math would be an optimisation over computing 256x240 screen pixels and applying colour math to them. This would be an optimisation in hi-res mode but I'm fairly sure the SNES can't do colour math (at least not as intended) when it is in hi-res mode. The fact colour math is potentially CPU intensive might be why SNES9x can disable them optionally, in older computer it might have been necessary to do that in order to run games at full speed. how do emulators process images to end up being that fast? They just emulate the graphics pipeline of the emulated system. All that happened is that the colors used by certain backgrounds and sprites are darkened. For each pixel on the screen, the hardware (or the emulator) determines which tile is used from each background and which pixels in these tiles are used. SD3 uses graphics mode 1, in which BG1 and BG2 have 16 colors per tile and BG3 has 4 colors per tile. If the tile data for a tile's pixel is zero, it is transparent and another layer's pixel is used. So, in summary: the hardware/emulator does very simple operations on a few bytes. The real magic is how the game programmers used these facilities to create impressive effects. Emulators don't use floating-point math, for one thing. Well, that makes me respect emu-devs more. I need to have a look at how they accomplish that. Until very recently, working with floating-point numbers was much slower than with integer numbers. The SNES has a screen brightness register; that's what most games would probably used to darken the screen. [...] Now, if you have to take into account the new colors produced by alpha blending, having to locate every new color (probably it didn't exist before) can be a slow operation. Also, does the snes employ a different palette for every sprite/tile? Emulators do not go through the picture looking for colors to change - the games simply generate slightly different source data (different palette entries) and the hardware/emulator generates a new screen from that initial data. You can read more about how the SNES renders the screen in this document (among others). I'm glad everybody is taking the time to give thoroughly answers, including links and pictures. I'm learning immensenly. SNES hardware color math doesn't involve multiplication; it's just addition or subtraction with an optional right shift (basically - I'm not sure what the exact hardware implementation of the division by two is). It's done once per pixel, as the PPU is generating the signal to send to the TV, and the result is not stored. But i was under the impression the snes actually supported different grades of transparency, for example https://youtu.be/XNQm9idpB1M?t=5m48s (clouds) or https://youtu.be/986vcULjMq8?t=25s (Boss). I was under that impression, the day-night cycle is handled more gracefully in DQIII, probably with "handmade" palettes. But i suppose at some point it must transform this array of indexes into an actual rgba array. In that case, it must compare if the pixel is 0 or not. By the way, this thread improved my code, mostly thanks to avoiding floats at some places and processing unique colors and then replacing rather than processing the whole image. Also gave me a closer insight on how the snes works., Sometimes technical documents are too technical. But i'll have a glance at these links, the blending formulas are simple yet effective judging by the results. No, transparency is just half transparency. Multiple grades of transparency can be simulated by using additive color math and fading the palette to black. Example: the Great Fairy in LTTP (you'll notice there's kind of a "jump" as it switches to additive blending but the rest of the fade is smooth). But i suppose at some point it must transform this array of indexes into an actual rgba array. In that case, it must compare if the pixel is 0 or not. That's done before converting the tile data to actual colors. depending on $2130 bit 1 and $2131 bits 6-7.
the Color Window is clipping colors here). (31,31,0) and the fixed color is (0,16,16), the result is (31,15,0). 0 11: Subtract the fixed color, and divide the result by 2 (unless CW etc). fixed color with no division. 1 10: Subtract the subscreen pixel/fixed color. the fixed color with no division. In short, transparency can either be on or off, and any other level of transparency is just transparency + changing the palette. If you ever see a smooth complete transition between invisible to non-transparent, it's probably done using a duplicate BG with a darkened palette on the subscreen with color math applied to sprites. I get it. I must say in favor of the snes that blending formulas are good enough to fool me. Is not a big deal of a limitation if it works as intended. The docs and videos were pretty interesting, i will spend some time searching for more on youtube. Ripple waving like the one in the video is done easily enough on systems that can do it (Sega Master System is one that can't): the code manually changes the vertical scroll on each scanline, usually through an interrupt, but can be done with timed code on other systems. Changing the horizontal scroll on each scanline gives the familiar wavy/fire effect seen in Thunderforce III, etc. In addition, the SNES and Mega Drive can both do offset-per-tile, or column scrolling. This can result in a wavy effect like this, or a fake rotation effect when combined with line scroll, like this, or this (note that only the backdrop is using this trick; the polygons are rendered at the proper angle). This scene combines horizontal and vertical line scrolling in the backdrop layer with column scrolling in the foreground, plus what looks like addition with the constant colour, and mosaic when you touch a Fuzzy. The Mega Drive can use scroll offsets for every 16-pixel-wide column. The SNES can do it in 8-pixel columns, but you have to sacrifice a background layer - in Mode 1 you have two 4bpp layers and one 2bpp layer, but you can't do column scrolling; in Mode 2 you can do column scrolling but the 2bpp layer is gone. (Similar sacrifices are made going from Mode 3 to 4 and from 5 to 6, for the same reason, that being VRAM bandwidth.) On the Mega Drive there is no third layer, just the two 4bpp layers, meaning Mode 2 is a reasonably close match to the Mega Drive's feature set. Another real neat trick you can do by carefully adjusting the scroll during hblank interrupts is vertical scaling. Thanks, the snes pipeline seems to be complex, given all the stages you have at hand to alter the output. Well, i'm glad i had this thread. Got a lot from it, and i really like to continue but i don't know what more to ask. My experiment was fulfilled successfully. I did not know exactly if emulators pull other tricks to relieve the lack of custom hardware, but just by knowing what is going on behind the scenes on the snes gave me many ideas to optimize the engine. The difference of knowledge between the average user and me is huge but i'd like to lurk from the darkness to read more interesting threads. I thank everyone who answered and provided me with examples to ease my understanding. And i'd say this thread will come handy for many people in my situation, maybe this place is out of the radar for the ones in my shoes, but regardless of that, the thread is here waitting for whoever arrives at it.